Flesh chomping, brain biting, limb severing: why do zombies have all the fun? Now you can make your own edible little people and get some zombie revenge at the same time. With a little slicing and icing, simple gingerbread cookies morph into creepy yet delicious corpses for you to feast upon. And you don’t even have to resort to cannibalism! 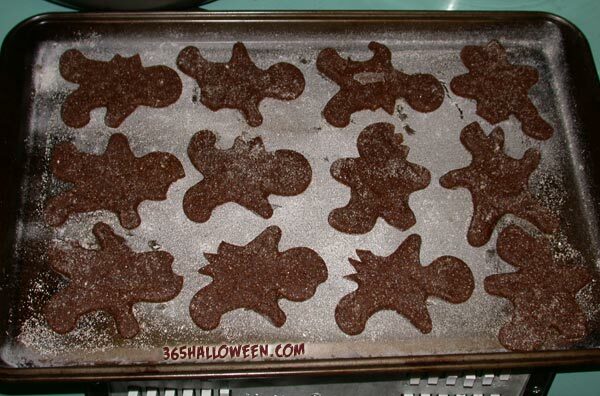 Use a standard “gingerbread man” type cookie cutter or anything that resembles a human. There are some “running man” shapes available that would probably be perfect. Then take a sharp knife and cut off legs, arms, chunks out of the head, etc. UPDATE: Perpetual Kid now offers “ABC Gingerbread” cookie cutters that would work perfectly. After you have transfered them to a cookie sheet, use your fingers to further distort them, bending their necks and limbs at grotesque angles, making some limbs longer than others. Just try to keep a uniform thickness so they will bake evenly. After baking the bodies and letting them thoroughly cool, it’s time to add the details. Using a thick decorator’s frosting (loads of powdered sugar with a dash of liquid) in an icing bag and a small tip, pipe on some features and gore. With plain white frosting I added zombie features like exposed ribs, torn clothing, uneven or X-shaped eyes, and gaping mouths. A line of frosting around the edge gives it a more complete look. Then add reddish food coloring to the remainder of the white frosting and pipe on the gore (natural food dye in red/blue worked great; it gave an almost mauve color that looked more creepy than the standard Romero-red). Place “blood” on the edges of torn limbs or anywhere that you’ve inflicted damage upon your appetizing army of the undead. Exposed walnut brains are a delicious crowd pleaser; immediately place a walnut piece after adding a small pile of “bloody” frosting on the head wound. 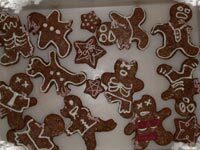 Final step: remorselessly devour these gingerbread ghouls. If you make your own cookies, we’d love to see pictures! Below is the recipe I used, which manages to be both kinda “healthy” and delicious. My taste testing group loved it, and one person even said they were “the best gingerbread I’ve ever had”. Preheat oven to 275Â°F. Lightly oil two or three baking sheets with vegetable oil, then dust with flour. Mix the sugar (or fructose), ginger, cinnamon, baking soda, and salt in a large bowl. Add the molasses and soymilk and mix well. Add 1 cup of flour and mix well. Mix in enough of the remaining flour to make a very stiff dough. On a floured surface, roll a portion of the dough with a flour-dusted rolling pin to 1/8 inch thick (or even thinner if you like them crispy). 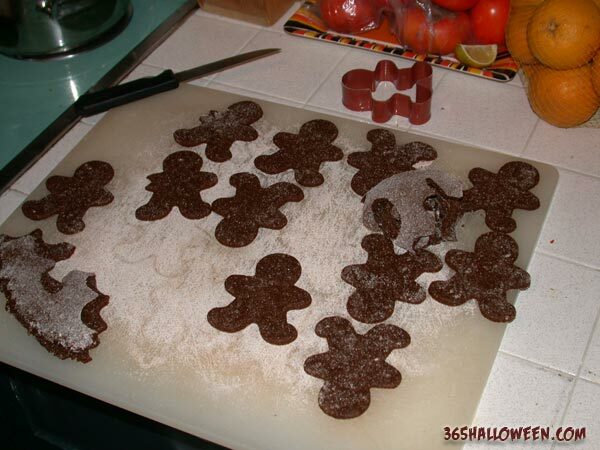 Cut the dough into human shapes with a flour-dusted “gingerbread man” type cookie cutter. Using a knife, cut off legs, arms, chunks out of the head, etc. Use your fingers to further distort them, bending their necks and limbs at grotesque angles, making some limbs longer than others. Just try to keep a uniform thickness (about 1/8″) so they will bake evenly. Using a spatula, carefully transfer the cookies to the baking sheets. Bake until the edges are dry and the centers give just slightly when pressed, about 20 minutes. Cool on a baking sheet for 5 minutes, then transfer with a spatula to a wire rack to cool. Once fully cooled, store in an airtight container. Makes about 48 cookies. 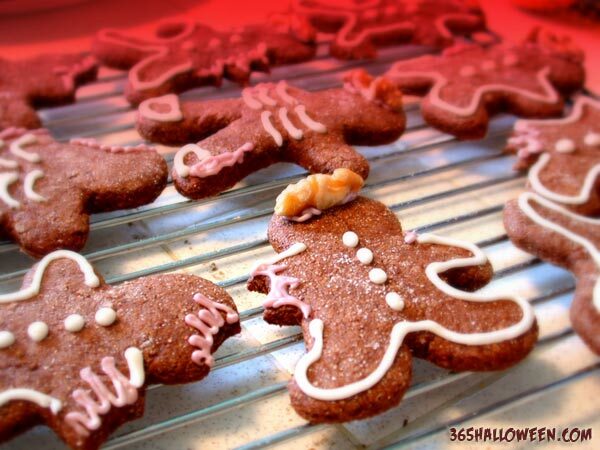 create your own Gingerbread Zombies Recipe. 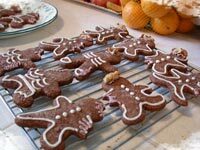 Subscribe to comments with RSS or TrackBack to 'Gingerbread Zombies Recipe'. 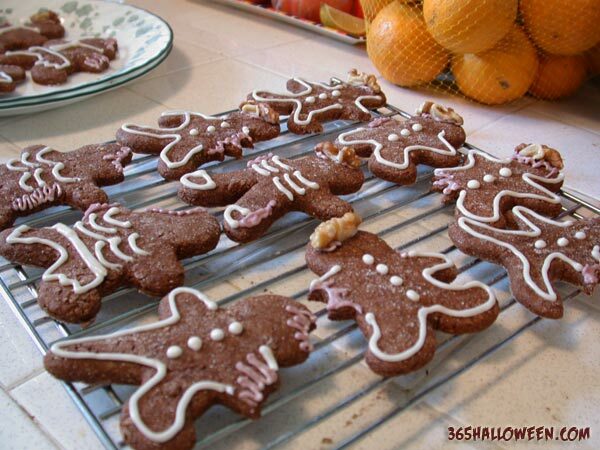 A few years ago, I made “autopsy-cookies” using gingerbread-men shaped cookie cutters and sugar cookie dough. 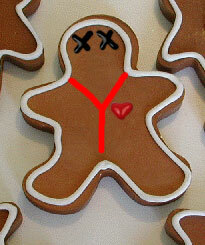 I decorated the cookies with frosting “Y-shaped” incisions, X’s for eyes, and heart shaped cinnamon candies. Some people thought they were fun, but a lot were surprisingly grossed out. C’mon, people, I didn’t MAKE them in the morgue! 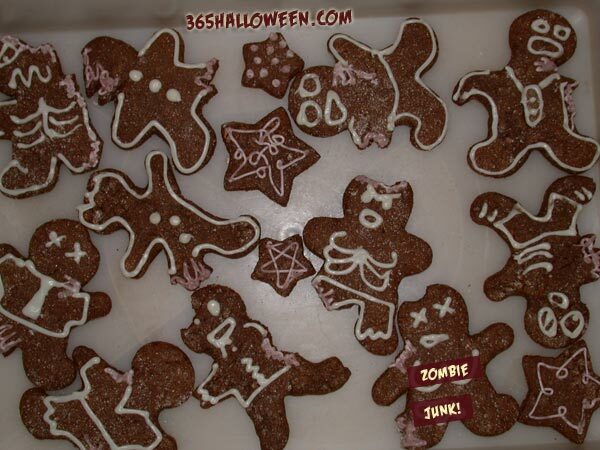 Lol, zombie gingerbread cookies ey? This is such a neat idea! I can’t promise I’ll steer completely away from cannibalism, but these might help a little.